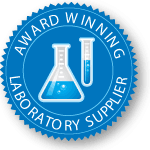 This website features many of our products but we offer all your laboratory needs, from basic supplies to a fully outfitted lab, including furniture. As always, you’ll find high quality at a great price. We encourage you to contact us if you don’t see what you need! We’re also happy to cross reference ThermoFisher Scientific, VWR Scientific and most manufacturer item numbers.